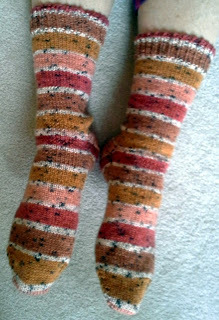 After knitting "boot" socks for everyone else who is "sock-worthy" in my family, I finally knit a pair for myself. 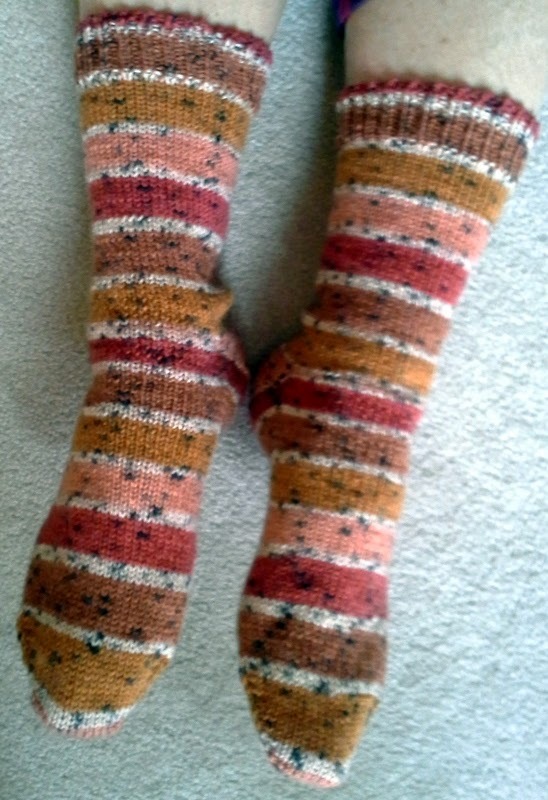 What makes these boot socks is the yarn is DK weight and I make the tops taller than usual. Pattern: None to speak of, just your basic toe-up socks. I have one more skein of this DK yarn, and my crystal ball says they will become another pair for ME. The only question is, will that be sooner or later? Since we still have the month of February to get through, I'm thinking sooner. I finally purchased a Styrofoam head, at Joann, for about $2.50 (with coupon). It's not quite adult size, but will suit my purposes. I'm guessing someday my g'daughter will get hold of it and apply "makeup". While binge watching "30 Rock" (it started when I was laid low by a nasty cold), by season six I was spotting a lot of what looked like hand knit items. Most were worn by Tina Fey, a.k.a. Liz Lemon, but not always. If I were to design a hat and call it "Sockhead", I would make it like a sock, complete with heel turn and Kitchener toe. This Sockhead hat was much easier than that - four inches of ribbing, nine inches of stockinette, crown - but felt interminable. HOWEVER. It was excellent brainless knitting, the yarn is pretty and soft, and I was able to binge watch "30 Rock" for much of it. I really need to get a mannequin head for hat shots. Trying to showcase the slouchiness of this hat by taking a "selfie" in the bathroom mirror just does not cut it. 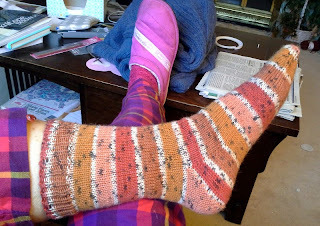 Sometimes I post an end-of-year recap of everything I knit in the past 12 months. With the way I procrastinate and have WIPs/UFOs with project lives that cross years (decades? ), this exercise seems more and more pointless. Besides, I didn't finish all that much this year: two pairs of preschooler socks, two scarves, one vest, five pairs of adult socks, two preschooler sweaters (neither of which g'daughter will wear), three hats, one pair of preschooler mittens, and a doll's cape. My excuse is that I was, in spite of retiring mid-year, very busy. The Gray and the Black Mittens - all that remains is a thumb. ONE THUMB. Easy as Pie Blanket - My g'daughter has probably given up on this project. EZ Suspender Cardigan - All this needs are buttons. BUTTONS. Minimalist Cardigan - All this needs is seaming. SEAMING. NO BUTTONS. There is a hat in the car that I work on while waiting for one thing or another, a project that I did not enter into Ravelry and whose pattern completely escapes me. Hopefully, there is a note somewhere, to remind me what it is supposed to look like. There are also some unfinished projects I plan to frog: toddler wear that the g'daughter outgrew already, schmattas that no one I know will wear, etc. I am also eyeing a couple of FOs that languish and give no joy - maybe they will be repurposed somehow. Knit Your Family sweater - My own design, inspired by Ann Shayne's Knit Your Life sweater. And then there will be the usual xmas knitting. Maybe this is the year I knit felted slippers for all. And I'd like to learn to darn socks. I even purchased the egg for it a while back. But what about the spinning? you may well ask. Somehow, some way, that has fallen completely by the boards. The woman I purchased by wheel from holds a "spin in" once a month at her shop, and there is a spin in at Teasel Hill Angora Farm whenever a month has a fifth Saturday. Attending these events is part of my get-out-and-about-more resolution, and hopefully they will help jump start the wheel. Any New Year resolutions or goals for you this year?